We all love portable hard drives for their ease of use and additional storage capacity. Since almost everyone nowadays has a laptop, with a limited storage capacity, it can be quickly filled with downloads, movies, music, photographs. Without using external storage device, your internal hard drive can get overstuffed, which leads to slower response of your operating system. Therefore, using external drives to store accumulating data is very convenient. 2.5″ drives are more portable option, since they can run off a single USB cable and do not have to be plugged in to the wall. Majority of 2.5″ drives that are being produced are SATA interface. However, recent external hard drive developments have trended into something untraditional, and that is a proprietary USB interface. One of the most common hard drives is myPassport by Western Digital. How Does USB Interface Effect Data Recovery? USB interface complicates the recovery procedures slightly because additional work would have to be done, in order to successfully recover information from an inaccessible drive. Firmware manipulation utility sets are commonly used for all kinds of data recovery processes. These utilities are not as comprehensive for USB interfaced drives as they are for SATA; At least not yet they are. Some tools are being developed, but they are not capable of performing full range of tasks as offered for SATA. Many data recovery companies are still having trouble getting these drives recovered, because of the facts listed above. 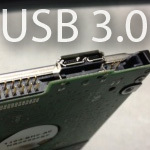 Recover USB Drives That Require Serious Firmware Manipulation? Here at HDD, we have a tremendous success with recovering data from Western Digital Passport not recognized hard drives. WD drives that come with proprietary USB interface can be converted into SATA. This conversion is our in-house developed technique that allows us to use traditional methods of firmware manipulation on defective hard drives. Consequently, we are able to use most powerful equipment and maximize our recovery results. WD Hardware Encryption is an additional obstacle in performing data recovery on the hard drives. The data on hard drive is encoded and gets decrypted by a designated chipset before spitting it out into USB interface. Hence, converting these drives into SATA would only give us access to data in encrypted form. Our proven ability to reconstruct encrypted data back into its original form, sets HDD apart from our competitors. Countless hours of research and development of this recovery approach have now helped hundreds of people to get their lost data back. If you found yourself in the situation where your Western Digital Passport is not recognized anymore, and you need to recover information from it, then you may submit your request for recovery here.